"There was no difference in total and LDL cholesterol between the two groups. Patients with previous myocardial infarction had significantly higher levels of insulin, insulin resistance [and several other things I'm not interested in, which they would like to treat]..."
Insulin resistance is the problem, on a mixed diet. Do you think this might show in the HbA1c, just as it does here in Norfolk for us non hFH folks? "Of special note is that HbA1c showed a significant correlation with average ATT [Achilles Tendon Thickness], independent of other parameters..."
Achilles Tendon Thickness is a marker of Badness in hFH. As your tendon thickens, so too does your carotid intima thicken. In general, patients with hFH tend to have rather good glucose control compared to the general population. That might just be why they live as long as they do under the correct circumstances. But with hFH I suspect that, should you manage it, developing metabolic syndrome may be a very unforgiving problem. You have to wonder what side stepping the syndrome by low carb eating might do, giving chronic normoglycaemia without elevated post prandial insulin. Not holding my breath waiting for that one. BTW, as statins worsen glycaemic control, could they actually make the CVD problems worse for hFH patients? Surely not. Surely we have stopped making booboos of this type. Of course we have. Of course. The lead author does not appear to be a LCer. In general his publications are rather pro plants and quite mainstream. 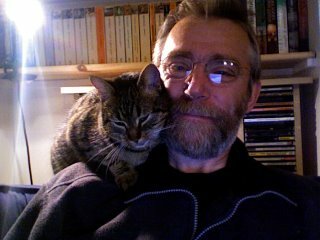 To his credit he has published some negative studies amongst the pro plant stuff. Harvard, ultimately, is no hotbed of pro Atkins zealotry. Of course the Atkins diet was an unrestricted calories diet, Zone has a caloric restriction applied. 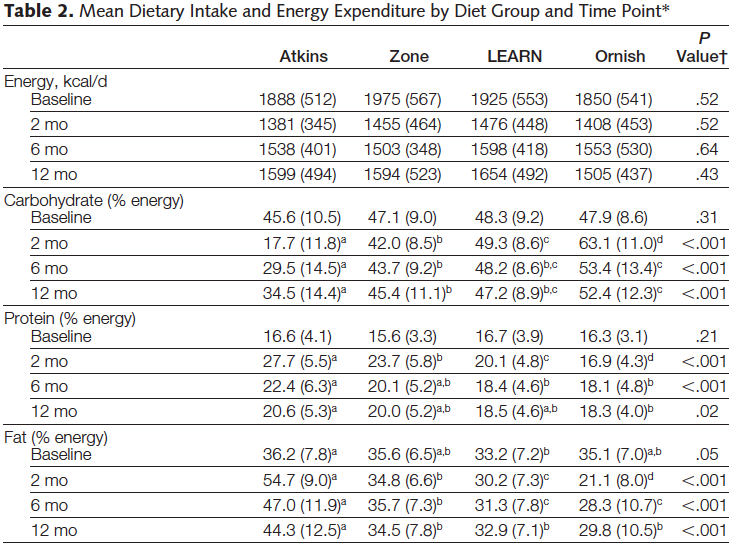 I have the impression from the data of the A-Z study that low carb is good, slightly higher carb is acceptable, adding more carbs back in is a booboo and that the Zone is crap. Just an impression. From the graph. As an aside, of course the unanswered question is what, exactly, would a sustained 54g carb intake have produced in terms of weight loss over 12 months? Or 20g/d over 12m? It is very clear that carbohydrate restriction only works WHEN YOU RESTRICT CARBOHYDRATE. A low carb diet does not appear to be as effective as a low carb diet when it has morphed in to an ex low carb diet through added carbs. A similar pattern might apply to ultra low fat diets if anyone wants to go down that dark alley. They don't work when you add fat. Assuming you don't mind the biochemistry while you eliminate fat. My problem is trying to square the circle between these two studies. Obviously, no study is free of bias. 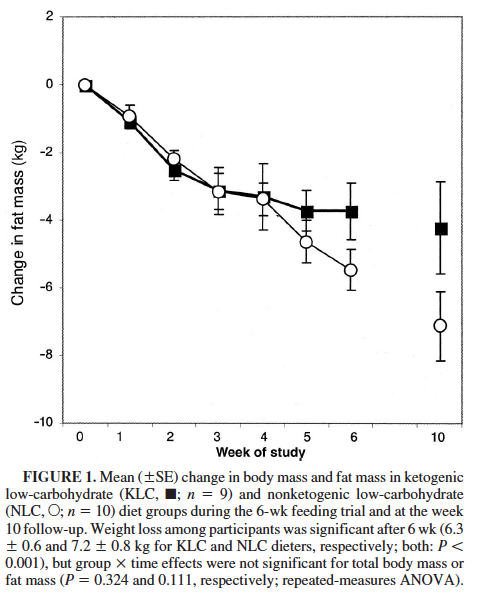 I struggle somewhat with Dr Sears, of the Zone diet, being the group leader of the study which shows a diet with 133g/d of carbohydrate out performs a ketogenic diet. That is very strange and doesn't happen in Stanford. People must make up their own minds. I think it is quite clear how I view insulin detemir. Kindke was unable to resist finding the link to the abstract with the diametrically opposing view. I'll just stick both links in here to keep them together, so people can look at both research findings and draw their own conclusions. Insulin detemir is not transported across the blood-brain barrier. I think it is reasonable to assume that at least one of these two papers is factually incorrect. If you search on Begg and Woods as co-authors you will find papers redolent with words like "reward", "hedonic" and "dopamine". That's Begg and Woods, if anyone can stomach it. I was, in my normal confirmation biased way, much more interested in the sort of work produced by Banks, Morley and/or Mooradian. These folks appear to be scientists rather than psychiatrists and they have some great publications. They include major work on the blood brain barrier, leptin transport, insulin transport, leptin resistance, gerontology, diabetes, antioxidants, the list goes on and on. Here are a few little gems I particularly enjoyed in abstract form which might be worth a mention. Alpha lipoic acid is a mitochondrial component present in normal cells and is available in mega doses as a supplement. It's a serious and deeply mitochondrial penetrative antioxidant. It helps a lot with diabetic neuropathic pain. SAMP8 mice are oddities which have been bred for early onset senility and memory loss. They are used (probably totally inappropriately) for Alzheimers Disease research. Treating them with antioxidants improves their memory performance. You might think this is a good idea. The cost is measured by a shortening of their life as elderly SAMP8 mice from 34 weeks to 20 weeks after start of treatment (started at 11 months of age). This may or may not be a good thing if you are an SAMP8 mouse (death might be a release). How it applies to a person managing their diabetic neuropathy or trying to delay the progression of their Alzheimers Disease is fascinating and slightly worrisome. I'll stick to a life based around beta oxidation, normglycaemia and a little superoxide signalling, stuff the antioxidants. Last sentence of the abstract "These findings are similar to studies using other types of antioxidants". Sweet, provided you avoid sugar. And antioxidants. Mechanism of pain in diabetic peripheral neuropathy. Effect of glucose on pain perception in humans. Simple hyperglycaemia in a normal person reduces the threshold for feeling pain. It reduces the severity of pain you can tolerate. This applies to a normal human being on a glucose infusion or a diabetic person on a diet designed by a diabetologist, no glucose infusion needed. If hyperglycaemia makes a tolerable stimulus in to a painful experience and makes just bearable pain become unbearable, how many chronic pain syndromes would go in to remission with sustained normoglycaemia? Fat phobia makes this question currently un-answerable. The paper was published in 1984. Does anyone fancy having a gangrenous foot amputated for diabetic complications and waking up on a dextrose saline infusion in recovery? And then being offered the "diabetes diet" on the post op ward? I'll call a halt there. Life is full of interesting snippets which make sense. They usually come from the sort of people who say insulin detemir does not cross the blood brain barrier. Morphine is a rather odd opioid analgesic. It has a complex multi-ring structure with two rather prominent hydroxyl groups which render it rather more hydrophilic and significantly less lipid soluble than many of its relatives. If you bolus a patient with IV morphine there is a delay in its passage across the blood-brain barrier due to this relatively poor lipid solubility. Time to peak effect is significantly delayed to somewhere around 15 minutes because the brain concentration lags way behind the rapidly changing plasma concentration. The brain never "sees" the peak plasma concentration due to this delay. Now, if you boil some morphine up with acetic acid you can form ester linkages joining acetate on to those two hydroxyl radicals to give you di-acetyl morphine, better known as diamorphine or heroin. Masking the hydroxyl radicals markedly increases the lipid solubility of the drug and so the brain concentration rapidly follows the plasma concentration. In general lipid soluble agents cross the blood brain barrier rather faster than more water soluble agents. Peak plasma concentration will give a rapid onset peak brain concentration, which appears to be associated with effects rarely seen with morphine itself. Giving the enhanced recreational potential. This is all basic anaesthesia pharmacology with excerpts from Trainspotting thrown in. Insulin detemir was developed to give an insulin with a very flat glycaemia controlling effect for use as a basal or background insulin. The clever people at Novo Nordisk deleted the terminal threonine from the B chain and attached a medium chain fatty acid to the now terminal lysine at position B29. The rather nice 14 carbon saturated fat, myristic acid, sticks out from the insulin molecule and neatly binds to the fatty acid binding site of albumin. It does this very rapidly and keeps the insulin bound and ineffective. Over the hours which follow there is a slow dissociation of the insulin from albumin which allows a very shallow dose response rate for glucose control. Ideal for a basal insulin. There is a suggestion that this tagging of insulin might facilitate its transport in to the brain, a sort of heroin-insulin tweak. The idea is that myristic acid might facilitate the transport of insulin in to the brain and lead to a massive suppression of eating and subsequent weight loss. Assuming you are a true believer in the central anorectic effect of insulin. Which, sadly, I'm not. Years ago, when insulin determir was first paraded as the living proof of the central anorectic effect of insulin, I looked up its structure and thought, as you do, that FFAs in general have very limited access to the brain. Insulin is not morphine and the myristic acid is not acetic acid. That big, long side chain of detemir is directly related to the sorts of free fatty acids which are specifically excluded from the brain. My own prediction would be that insulin detemir would have a significantly REDUCED effect within the brain. Not a lot of mincing of words there. "Moreover, chronic intracerebroventricular insulin treatment of control mice increased fat mass, fat cell size, and adipose tissue lipoprotein lipase expression, indicating that CNS insulin action promotes lipogenesis. These studies demonstrate that central insulin action plays an important role in regulating WAT mass and glucose metabolism via hepatic Stat3 activation". Brain insulin controls adipose tissue lipolysis and lipogenesis. "Here, we show that insulin infused into the mediobasal hypothalamus (MBH) of Sprague-Dawley rats increases WAT lipogenic protein expression, inactivates hormone-sensitive lipase (Hsl), and suppresses lipolysis. Conversely, mice that lack the neuronal insulin receptor exhibit unrestrained lipolysis and decreased de novo lipogenesis in WAT". If you go looking you can find papers from Oz and Cincinatti which show that insulin detemir DOES cross the blood brain barrier and DOES suppress food intake, far better than neutral insulin does. In their own labs of course. But I cannot forget that if you transport a researcher out of a Cincinatti psychiatry department and put her in to an industrial insulin lab she cannot get any effect of centrally infused insulin detemir or neutral insulin for that matter. Novo Nordisk cannot demonstrate this marvellous effect of insulin, even their own special insulin, in their own lab. We all know that much of the mindset of obesity research is not particularly effective at producing results which work. How they get the results derived from their ideas in their labs is what fascinates me! You couldn't make stuff up this counter intuitive. Maybe in another post. 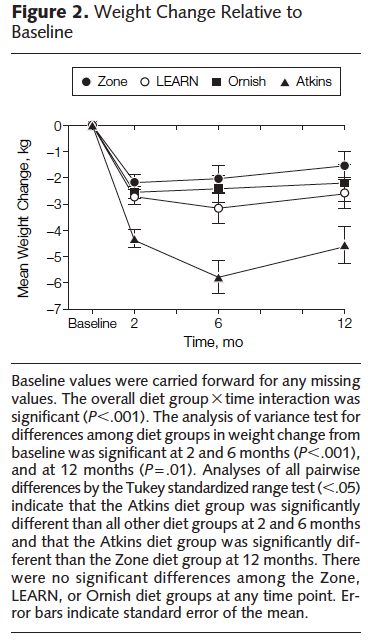 Insulin detemir causes a small weight loss in morbidly obese patients, those with BMI >35kg/m2. Why? Because it blocks the brain entry of the chronically (and markedly) elevated levels of insulin so common in the morbidly obese. It has limited or zero effect within the brain in its own right. The brain simply loses awareness of the systemic pathologically elevated insulin. If plasma insulin is high enough this sudden loss of insulin's access to the brain can result in a decrease in brain driven, neurologically mediated, forced lipid storage in adipocytes, i.e. a little weight loss. In the absence of marked hyperinsulinamia, i.e. in less obese type 2 diabetics, insulin detemir causes weight gain because there is less tonically elevated plasma insulin for the central uptake blockade to neutralise. 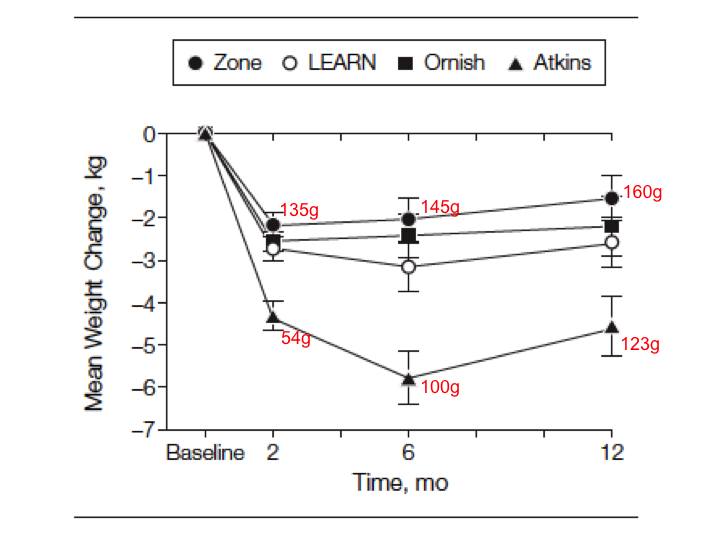 There is no weight loss effect, although gain is undoubtedly blunted. Insulin detemir is the best indicator I have seen that the central role of physiological concentrations of insulin within the brain is to augment fat storage. This makes sense to me. I wouldn't ask a psychiatrist to develop an anaesthetic protocol. Or a weight loss protocol!